Located in the heart of charming Mérida, the Hotel Hacienda Mérida offers elegant accommodations in a historic building that dates back to 1840. The hotel is an amazing haven of relaxation, right in the middle of the vibrant capital of Yucatán. Discover the exceptional history, great entertainment, and rich culture of the city, while enjoying the peacefulness of this delightful former hacienda. Experience this hidden oasis, where contemporary art deco chic meets colonial classicism, in the spacious and intimate lodgings with its exquisite canopy beds and luxurious Egyptian cotton sheets. Along with an outdoor pool, the Hotel Hacienda Mérida has a courtyard, business center, bar and lounge, and massage/treatment rooms. Amenities include complimentary WiFi, self-parking, laundry service, and tour and ticket assistance. 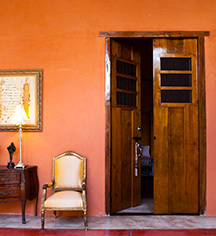 For guests who desire more privacy, the exclusive Hotel Hacienda Mérida VIP is a remodeled 1820 historical home into four lavish guestrooms, complete with distinguished hospitality and personalized service. Hotel Hacienda Mérida is centrally located in the White City, close to nearby attraction such as the Mérida Cathedral, Parque de Santa Lucia, Paseo de Montejo, and Mérida English Library. It is a short walk to the main plaza, where visitors can find authentic eats and eclectic shopping. 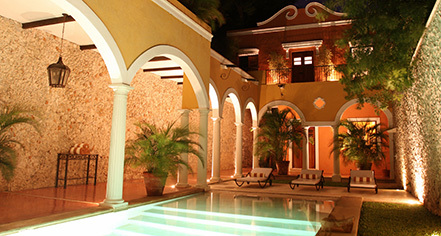 Hotel Hacienda Mérida, a member of Historic Hotels Worldwide since 2016, dates back to the 18th Century. Abstract paintings created by Phillipe Duneton adorn the walls in all guestrooms. Cancellation Policy: Cancellations must be made 7 days prior to arrival. Late cancellations will result in one night charge. Hotel/Resort Fees & Taxes: Please add 19% Mexican Government taxes to room rates. Located in the heart of charming Mérida, the Hotel Hacienda Mérida offers elegant accommodations in a historic building that dates back to 1840. The hotel is an amazing haven of relaxation, right in the middle of the vibrant capital of Yucatán. Learn more about the History of Hotel Hacienda Merida .